Arsenal manager Arsene Wenger believes their Champions League defeat by Schalke should be "put in perspective". Wenger believes there has been an overreaction to Wednesday's defeat - their first home loss in Europe in 43 games - as Arsenal look to bounce back at home to Queens Park Rangers. "We have lost one game in 43 home European games. An accident like that can happen," he insisted. The Gunners also lost 1-0 to Norwich in their last Premier League match. But Wenger's side were in good form before the recent internationals, with only one defeat in all competitions prior to the break. Arsenal's last game before the internationals was a 3-1 victory over West Ham and the Gunners manager is confident his side will get back to winning ways against Mark Hughes's bottom-placed QPR in Saturday's Premier League encounter. 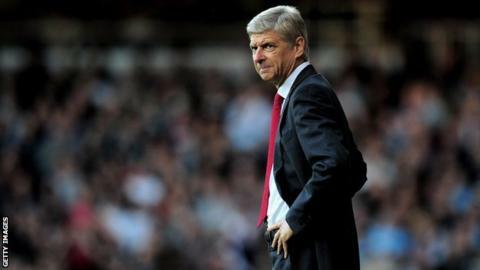 Wenger said: "At West Ham, we looked outstanding going forwards, dynamic and then suddenly had two flat performances. It is difficult to explain. "We have hit the wall a little bit in the last two games, and just did not find our rhythm. "But we have to just focus again on the quality of our game, the way we want to play, and not concede too much against who we play. "With the quality we have, the results will come back." Wenger is hoping to welcome back Alex Oxlade-Chamberlain from a hip injury he suffered as a substitute at Norwich, but Kieran Gibbs (thigh) and Theo Walcott (chest) remain out. Jack Wilshere's rehabilitation from long-term injury continues but he could be included on the bench, while defender Bacary Sagna has recovered from a broken leg. Wenger insists his side cannot overlook QPR even though their London rivals are yet to win a league game this season. "From game to game they are improving," added the Frenchman. "You look at their team sheet and they have good players, he is slowly turning them around."